Mark Gallivan takes a look at the best executive cars on the market in Ireland for 2019. Depending on your view, the rise of the ubiquitous Crossover SUV and impacted demise of the executive car in the hearts and minds of Irish new car buyers is either one of two things; pretty depressing or simply a change in what consumers perceive as motorised status. In the first two months of 2019, six of the top ten selling new cars in Ireland were Crossover SUVs. If you dig deeper into these very same statistics and combine Jeep and MPV sector cars, a total of 22,049 were sold against 6,512 saloon cars. It seems buyers now champion a taller driving position, better versatility, load capacity and quasi go-almost-anywhere capability while sacrificing any semblance of driving enjoyment and the consequential trade-off of a compromised cruising refinement. Speaking of the executive car segment, which ones should you consider? As a segment, it is defined by the contenders like the BWW 3-Series, Audi A4 and the Mercedes C-Class. What is the real winner here and what are the quirks and gripes that you may not have heard in other car reviews? If you’ve quietly held a suspicion that the BMW 3-Series has slipped a bit in recent years, you would be correct. Somehow the cars core DNA of best in class steering and chassis dynamics was often described as very good rather than outstanding. 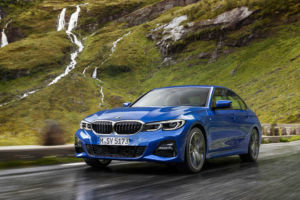 Enter the all-new G30, the seventh generation of BMW’s executive car and now with a guarantee that BMW has mended the less-focused dynamics and delivered electric steering communication that is amongst the best I’ve tested. The step up in cabin architecture, with a new digital dashboard, makes good strides in keeping up with Audi’s A4. You’ll like: Best in class driving dynamics, an improved infotainment system, fabulous agility and rewarding dynamics. Cabin a proper advance in design. You’ll grumble: Avoid run-flat tyres – they ruin the ride. New digital dash less easy to read than analogue dials. M Sport trim is best option for looks but adds a harsh ride. Isn’t this where we’d usually find the Audi A4? It was. It was after testing the facelifted C-Class Saloon, Estate and fabulous Cabriolet recently, did I shift my opinion. True, the C-Class interior and actual build quality trails the A4 in places and if we’re being honest, only matches it for driving engagement. But as an overall ownership proposition for middle management executives – those with a burning ambition to do better – the Mercedes C-Class in any of the variants is a beautifully crafted car. Sporting an intriguing range of smaller four-cylinder 1.5-litre petrol engines and 1.6 petrol/electric regenerative hybrids, along with the larger perennial larger engined diesel and petrol engines, the range is vast enough to suit all buyers. Where the Saloon version of the C-Class scored well is the rear-wheel drive bias and creamy smooth steering and suspension composure. Of all the cars tested in this segment, it’s the C-Class you’d drive after a long day and 300 kilometers to travel before reaching home. 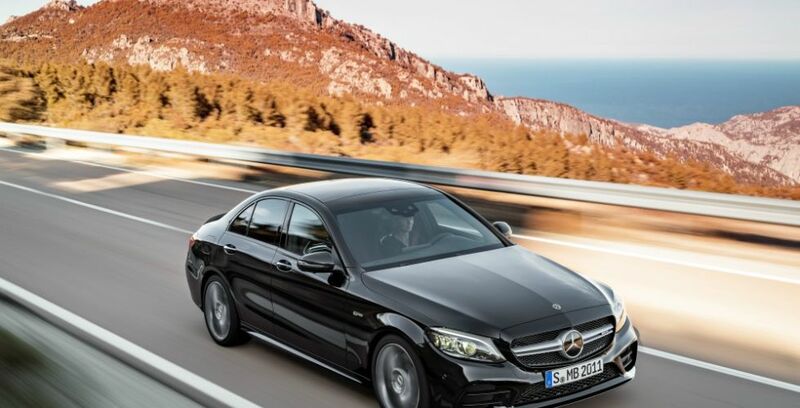 Everything in the C-Class is geared towards reducing stress and eliminating unnecessary fatigue. And this all-around package is not limited to the Saloon. You can also opt for the Estate, Coupe or Cabriolet version. It’s a close thing, but the C-Class pips the Audi A4 to the second place spot. You’ll like: Classy and composed with junior S-Class styling. Surprisingly fun to drive. Lovely cabin. Smart 1.5-litre petrol engine a good bet for low mileage drivers. You’ll grumble: Gearbox kick down is slow. Some interior fittings would shame a VW Golf. Pricey options. Just because the Audi A4 was launched four years ago, it doesn’t mean it is now relegated to an also-ran. 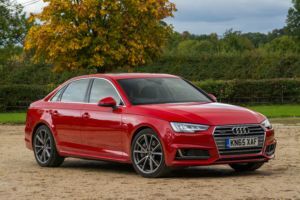 So much was right from the start with the fifth-generation (B9) Audi A4 that it still warrants serious consideration for your executive car choice in 2019. No other car in the executive segment is better constructed and feels like it could survive everyday business and family duties for years while remaining largely unscathed. The car’s only demerit is after four years, Audi needs to update the exterior look and cabin layout. Lastly, if you’re less than six foot tall, make sure you test one over a longer drive. The driver’s seating position is set low and can feel claustrophobic. Otherwise, you’ll be treated to car that is a massive step up from the previous generation A4 and is decently rewarding to drive. 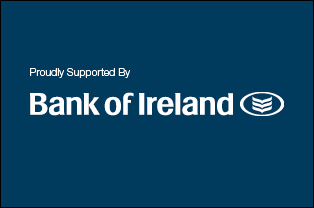 You’ll like: Bank vault build quality. Brilliant to drive, with excellent ride and refinement. Still looks sharp after four years. You’ll grumble: Engine’s momentary hesitation when accelerating a concern. Seating position set too low and proves claustrophobic. Cost of Audi’s options extortionate. A surprising fourth place is given to the Lexus IS for several reasons. Granted, it’s not down to the Japanese brand’s sales success during 2018. By shifting a total of just 484 cars and registering a paltry 110 Lexus IS models during 2018, it is the forgotten executive car choice. Indeed, as left-field choices go, the Lexus IS is a 2019 panacea for the executive that is still mourning the demise of SAAB in December 2011. But choosing a Lexus is to enter an elevated world of customer care and bullet-proof reliability. After all, Lexus won the top spot in the UK’s Auto Express with a golden 95.12 per cent reliability rating. In Lexus land you tend to bypass any semblance of indifferent customer experience. 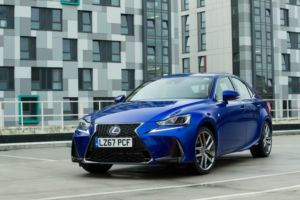 If you want to waft in a car that is constructed with millimetric precision and enjoy a cabin with solid sporting looks, then the Lexus IS as an ownership proposition with guaranteed rarity in the German default car park. You’ll like: Excellent reliability reputation. Genuine customer care. The 2017 update tweaked and honed the IS to within tiny tolerances. Immense and a brilliant left-field choice. You’ll grumble: Infotainment system is fiddly to use. Hybrid never as seamless as suggested.